When it comes to living a healthy lifestyle and losing weight, what you put in your body is with out a doubt, the most important factor. The truth is, you can spend hours of your day at the gym, 6x a week and if your diet is terrible, then nothing is ever going to change. The number one question I get, what my diet plan is and what I eat. The thing is, I do not follow a specific diet, but I do try to eat as clean as possible and follow the 80/20 rule. Meaning, 80% of the time I will always choose the healthiest (most clean) option but 20% of the time, I am human and will indulge on something I shouldn’t have. Clean Eating is the method of eating whole or what you would call ‘real’ foods as opposed to eating anything that is processed or pre-packaged. Eating foods as close to their original nature as possible. This means lots of fresh fruits and vegetables, healthy proteins, whole grains, nuts, seeds & oils. What’s wrong with pre-packaged foods? The problem started with the food service industry. Pantry’s are filled with processed foods that are made up of sodium, sugar, (bad) fats, and ingredients you cannot even pronounce. In some cases, you think you’re buying”healthy” options because the box says so, but the truth is, you have no idea what it is actually made of. In most cases, it’s not healthy at all. -Pre-packaged and highly Processed foods, which include sugary cereals, soft drinks, fruit juices, white bread, fast food, savory snacks (chips), frozen microwaveable meals, and canned vegetable, just to name a few. An easy way to tell if an item is something you should eliminate is by reading the ingredients. If an item has way too many ingredients or has ingredients that you cannot even pronounce, than you should probably get rid of them. For instance, if there is a product in your fridge or pantry, that lasts more than a year without going bad, than it’s probably not the greatest thing for you. The only reason it’s lasting so long, is because of the chemicals and sodium that are in it giving it shelf life. Remember though, not all pre-packaged food is bad for you. Example: almonds, chickpeas and spinach are all pre-packaged. The difference is, they are not highly processed. They are still natural and are considered whole foods. Another example would be items like spaghetti sauce. There are plenty spaghetti sauces on the shelf with 5 natural ingredients or less. It is just all about reading the label and really thinking about what you are putting in your body. What to Add in Your Diet. –Lots of veggies: If it falls from a tree or comes from a vine, then it is safe to say that it is a good option. Fruits and veggies are full of fiber which help make you feel fuller, longer. –Protein: Especially lean meats! They are a perfect source of protein because they are easier for your body to process. They are also great because your body needs protein! –Healthy fats: For example, those found in nuts and fatty fish. These kind of fats are good for your heart, as opposed to saturated fats (butter & cream) which are associated with increased risk of heart disease and should be limited. ***Update 12/3/17 12:06 PM – Daily, nutritionists go back and forth on debates when it comes to saturated fat. Some say it’s okay, others say to absolutely stay away from it. The only kind of fat that everyone agrees on to stay away from, is animal based saturated fat (cream cheese, butter, whole milk). As always, I encourage you to talk to your doctor. Especially if people have heart and/or high cholesterol problems. My favorite types of oil to cook with are Coconut oil, Avocado Oil and Extra Virgin Olive Oil. –Grains: Think “whole grains” like quinoa, brown rice, whole oats and rye bread. Steer clear of ‘white’ breads, pasta and white rice. –Drink your water! Drinking water keeps you hydrated and aids in burning fat. Fruit juices found at the super market are filled with added sugar. As well as sodas and all soft drinks. I love this method of eating because I know exactly what I am putting in my body. Do I eat clean all the time? No, I love a good sugary cereal once in a while! It’s all about moderation. 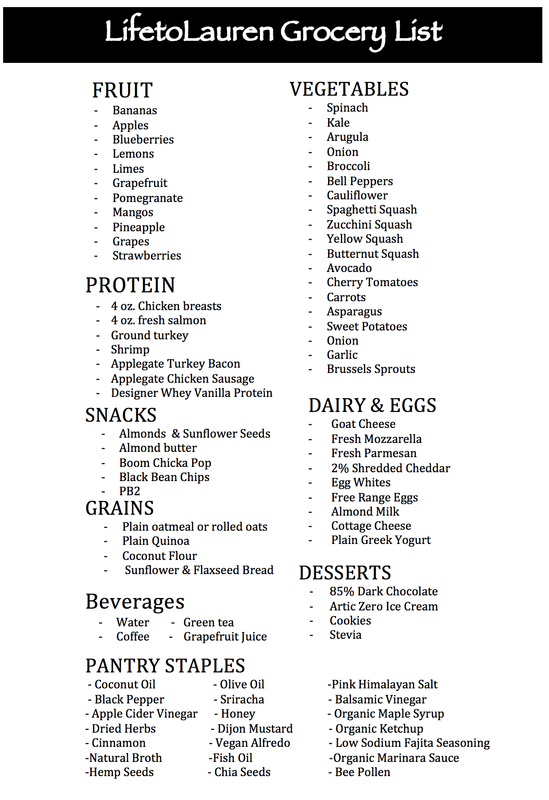 If you would like, you can find my full Grocery List Here. Or just type Grocery List into my search engine for the full post!